Safety: Safety is extremely important - a flyback is not a toy! Flybacks: What are they? How to get one? How to use it? Disclaimer: A flyback is not a toy! You must accept the fully consequences of your actions should you decide to build a flyback high-voltage circuit! 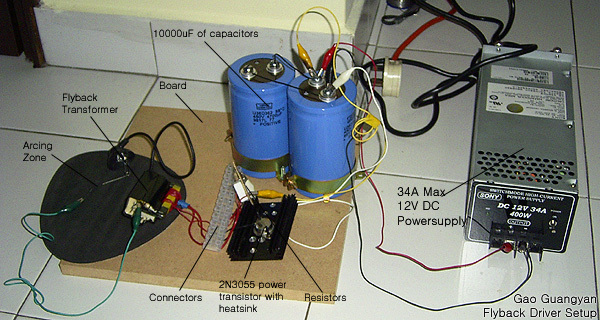 This project involves high voltages (several 10s of kV), which creates electric sparks that can easily jump an air gap. Despite the generally low current of a flyback circuit, the high frequency (several 10s of kHz) and whisper quiet operation can lead to complacency, especially because flyback arcs can appear to be harmless (and due to their high frequency, may not feel like much while current is flowing!). Electrical arcs are also very hot and can set fire to most things. Please take all proper precautions when working with a circuit like this. This project is highly discouraged for beginners without supervision. This is probably one of the best and easiest project for someone who is familiar with electronics, but wants to venture into high voltage. It requires little skills to set up the circuit, and only simple adjustments concerning the circuit is required. Although the power involved may not be very high, a small mistake might cause severe electrical burns. However, if safety precautions are taken, some marvelous high frequency arcs can be generated. As far as I know of, this should be the easiest circuit with which a high voltage output can be achieved. The original version of this circuit used 2 transistors. Burak (link to his page) modified it to work with a single transistor making it even easier and cheaper to build. Sam at Powerlabs has done the same circuit and has also achieved some very nice results with his flyback. This circuit is reproduced from Burak's page and is of his design (great job Burak!). Notice that it only 3 components - two power resistors, one power transistor and requires you to wind two windings on a flyback transformer! Unlike a normal transformer which operates at 50 / 60Hz, a flyback transformer is designed to operate at high frequency, so we cannot simply connect a primary on the flyback powered from the mains (DO NOT do this!). 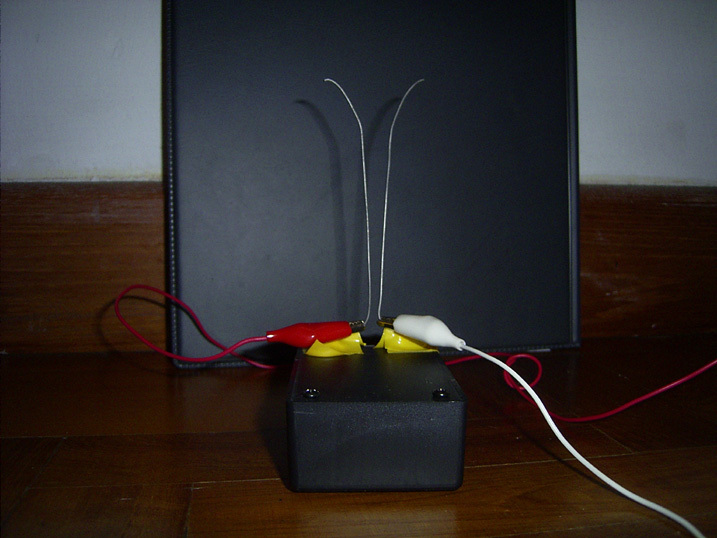 Instead, we need a circuit to generate a high frequency as input to the primary coil. While the above circuit is beautiful in its simplicity, it does have drawbacks. It cannot be run at very high power, and the transistor tends to get quite hot (and needs to be heat-sinked properly). Still, it is a very simple circuit for making high voltage, and can be used to draw electrical arcs, power Jacob's Ladders, plasma globes, and running other HV cascades such as Marx generators. When power is applied to the positive and negative terminal, current begins to flow through the resistors, as well as through the feedback winding to the base of the 2N3055 power transistor (for those who get confused easily, the 3 pins from top to bottom are Collector, Base and Emitter). This turns on the transistor, and current flows through the primary coil. 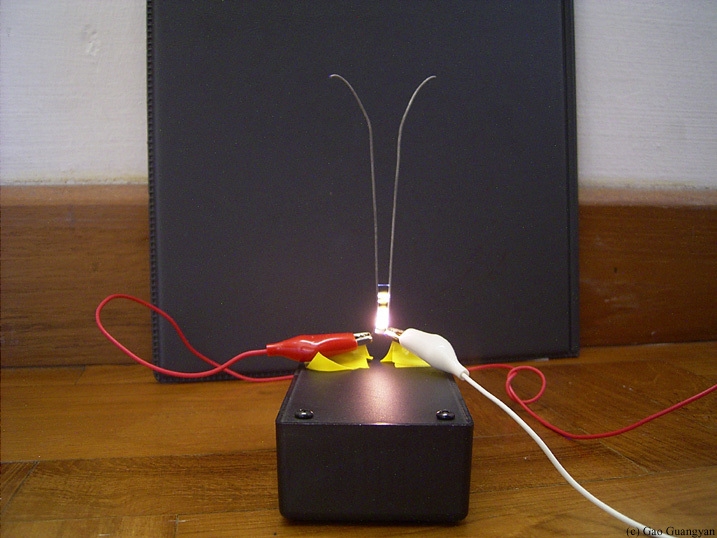 As this happens, a voltage is induced in the secondary creating our high voltage spark. At the same time, another smaller voltage is also induced on the feedback winding, opposite in polarity of the base voltage (you'll need to make sure to wind the windings in the correct direction), causing the transistor to turn off. As the magnetic field collapses, again high voltage is induced in the secondary. Now there is no more feedback current in the feedback coil, and once again current flows through the primary, and the cycle repeats at its own natural frequency. Because of this, the circuit is self-oscillating and settles at its optimal frequency depending on the loading. For example, as the arc is struck and drawn longer, the frequency increases from sub 20kHz to more than 20kHz, and becomes ultrasonic resulting in a beautiful, whisper quiet spark. See below for instructions on how to set this up easily! Unfortunately these are starting to get more difficult to find. 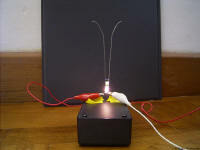 New flybacks with in-built rectifiers are however useful, such as running Marx generators, playing with ion-wind devices or charging up HV capacitors, but are useless for experiments requiring AC output such as powering plasma globes. Ideally you should try to find a flyback which either has a removable rectifier (usually encased in it's own case in epoxy). Other things to note are that these flybacks are sometimes stepped up on the circuit board with some sort of cascade or voltage multiplier, and therefore have a lower voltage secondary winding. Correspondingly, you should expect no more than around 10kV from them at most. Some of the best flybacks for making the highest voltages can be found in old black and white TVs. The nominal output current of flybacks are usually a few mA at most, but arc current can increase to several 10s of mA depending on the kind of driver circuit you are using. But... what exactly is a flyback? In short, a flyback is a type of high voltage transformer which generates high voltage of several tens of thousands of voltages at a high frequency of several tens of kHz. This high voltage is used to power the filaments of a Cathode Ray Tube found in TVs or Oscilloscopes. Because they act as a transformer, there are often extra windings on the secondary coil and provide lower voltages for other parts of the circuit, hence the large number of pins at the bottom of the flyback and they are used to power say the vertical and horizontal deflection coils, and so on. For more information on flybacks, read this excellent page. Now lets take a look at the two main types of flybacks. Lets take a look at these two flybacks. Notice the modern flyback (black one) is almost completely encapsulated with all the windings and HV diode (sometimes with adjustable output and focus controls) encased in a black shell. Compare this with an old-school flyback on the right with a fatter secondary. A fat secondary is something to look out for, since the bigger it is, the more likely it is to have more turns on it, and thus capable of higher voltage. Disk shaped secondary coils are even better (like shown above). Unfortunately these are more difficult to find. To find which is the secondary output's ground, you can use a multimeter, connecting one end to the high voltage output (red wire for the modern one and at the side of the secondary coil for the old flyback), and test all the pins at the bottom. The one with the biggest resistance will be secondary ground. The other pins are in fact auxiliary secondary windings / tapped secondary windings used for generating other voltages in the TV or CRO, but we will not be concerned with it for the purposes of making the highest voltage possible! I got my flybacks from a TV shop and paid $5 for them, but they are easy to find in old TVs thrown out in the trash. The general rule of thumb - the fatter the secondary, the better the flyback for making high voltage! Now let us get starting building our single transistor circuit. Some preparation should be done first. The first thing to do is to make sure your secondary coil is not burned out and this can be done with the multimeter test as described previously. Remember to mark the ground pin of the high voltage output. Next, inspect the ferrite core for any defects such as cracks - ferrite is a very brittle material and you should be careful not to damage it. Then we are ready to wind the primary coil. As shown above, most flybacks these days have an open primary allowing us to simply wind the primary coil. Old flybacks may have their own primary coil on it, which we need to carefully remove first without damaging the core. Next is to insulate the ferrite core (ferrite is partially conductive). we wouldn't want any high voltage getting back into our primary circuit in the case of a secondary coil failure! Capacitive coupling from the secondary may also induce some voltage in the core. I wound several layers of electrical insulating tape on the core. Now we can wind about 4 to 6 turns of reasonably thick wire onto the core. There is no fixed number and do feel free to experiment to see what works best for you. I found it best to wind the primary tightly and neatly, and then wrapping it with more tape to hold it in place to prevent any mishaps such as it getting loose and into contact with the secondary coil! Your flyback should be like the diagram above now. Next is to make the feedback windings. This is done in the same manner and thinner wire can be used. Around 2-4 turns should be okay. Again this depends on your particular flyback and transistor. Now your flyback should look something like the diagram shown below. Your flyback is completed and ready to roll! Now we need to wire up the driver circuit. This circuit generates significantly higher voltages than the flyback was originally designed to produce. Therefore, the pins at the botton of the circuit may spray corona or even form electrical arcs to the ferrite core! If this happens, covering the pins with epoxy or hot-glue might help since they are not needed. It is possible to generate even higher voltages from a flyback with a even more powerful driver but this may cause secondary coil insulation failure, rendering the flyback dead! Another point to note is in drawing electrical arcs from the output. Doing this continually stresses the secondary due to the high currents, and may also cause thermal failure, so experiment at your own risk! Some other points to note about the circuit is the power transistor. The transistor WILL RUN quite hot, and significant heat-sinking is recommended. It is also recommended that you obtain the high wattage white-ceramic resistors for use, but they should not get too hot. The 2N3055 should be relatively easy to find, but can be replaced with a similar high power transistor. Finally, it is advisable to ground one end of the flyback (the bottom end that you found previously), otherwise significant sparking may occur at the bottom pins. It is extremely important that you * DO NOT * come in contact with the high voltage output. 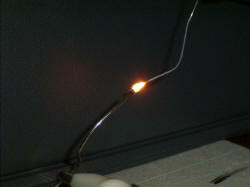 While the output wire is designed for high voltage, I advise moving it about with a short plastic pole for safety. The final piece of the puzzle is that you will require a relatively high current 6 - 24V DC power supply capable of supplying several Amps of current. An alternative is to use a few Lead Acid batteries to power the flyback. The values of the resistor are not fixed, and values for 150 to 300 ohms should work for the 5W resistor, and similarly 15 Ohms to 35 Ohms for the 1W resistor. I was originally not able to construct this circuit due to the lack of a good power supply unit... however I have recently acquired a 34A 12VDC power supply unit! (That's 408W of power!) The circuit is up and running! Here is a photo of my current setup. It's free standing and messy, but it works. I'll mount it in a nice box when all the fine tuning has been done. I am using a 12VDC switch mode power supply capable of supplying 34A. A car battery or a Lead acid battery would work too (and of course be more portable). The power supply must be capable of supplying around 3 - 10A, but this would depend on the resistor values and of course the voltage input. I placed a large DC electrolytic filter capacitor between the + and - of the power supply, and this is recommend for expensive power supply units. The filter capacitor helps smoothen out any switching noise from our circuit. My capacitors look so large because they are 450V 4700uF capacitors, but obviously something like 25V should work fine. Several thousand uF at 12V should work well. I am using a 2N3055 power transistor... it was cheap and easy to find, though not powerful enough for large power inputs. The resistors and everything else don't get too hot, but the transistor DOES. It becomes Very hot very quickly even with my heat sink in place. The heat sink will be upgraded to a larger one. When everything is completed and working, there would be a small purple arc between the two terminals. The arc produces a hissing sound and is associated with its frequency. As the arc is drawn, it develops into a high pitched hiss and slowly increase in frequency until it becomes ultrasonic (above 20,000hz) and it becomes quiet. I hooked up a small flyback from a modern tv, and it starts an arc at around 1.5cm. As a rough guide to calculate the voltage, it would be about 1.1kV per mm, giving me more than 16kV of high voltage! When setting up the circuit, it might be possible that your feedback winding is in the wrong direction - reverse the polarity and try again. You should also check that the HV is arcing to the correct return - an easy way to find out is to simply bring the HV wire to the bottom of the flyback. The spark should suddenly arc like crazy to one of the pins - that is the return pin you are looking for. If all else fails, check the temperature of your secondary. If it is too warm, you might have a shorted secondary and the flyback is no longer useful. The two large 4700uF caps have been replaced by a much smaller 62,000uF 40V capacitor bank to filter switching spikes. The heat sink has also been upgraded to a huge one and the transistor is much cooler. I noticed the resistors were starting to get quite hot so I'll be replacing them with 5 or 10W resistors just to make sure they don't blow. (My 1W resistor is turning brown!) Once everything is done, I'll mount it on a board, or in a box. Want to drive a flyback but don't have time to get the components or lacking a suitable 6 to 24V power supply? There is a great alternative! This was suggested by mws on an online electronics forum. The secret is to use a switch mode power supply 12V transformer such as the one below. The photo below is from him. 3. 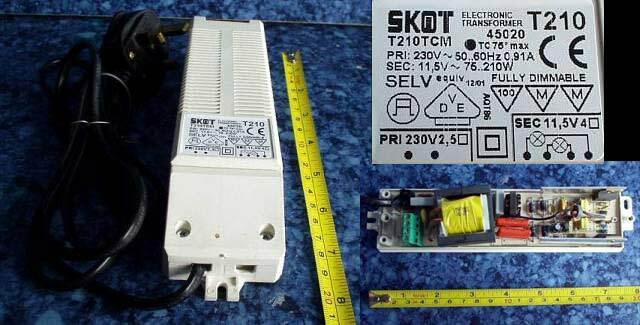 A SMPSU (Switch Mode Power Supply Unit) Electronic 12V halogen transformer. These are used for 12V halogen lights, and different from normal iron-cored transformers (which run at 50-60hz and are thus not suitable, and are much heavier!). These are electronic transformers with lots of components inside. These electronic transformers deal away with the heavy iron core of a normal transformer and run at a high frequency of around 20kHz to reduce the size and weight. Because of this, they output a high frequency, low voltage current that just happens to be perfect for driving a flyback! Above is what a good electronic transformer would look like. In this case, it has an output of 11.5VAC. This model supports a hefty 210 watts. All we need for an excellent flyback driver! However, in where I live in, it is difficult to obtain such a SMPSU. So I am currently using a smaller 50W electronic halogen lighting transformer. Try to get the good models (above 70W). Apparently, where I stay, I can't find any shop selling high powered electronic transformers so I am stuck with poor 50W transformers which can blow up if run for extended periods of time. You need to make the Primary Coil - this is only slightly different from our single transistor circuit. Insulate the core with many layers of good insulating tape first. Just wind around 10 turns and tape it all in place. If you experience any problems with the output, you may need to add a few turns to your primary. If there's not enough inductive reactance on your primary, you may be triggering the protection circuit. Most SMPSU / electronic 'transformers' have a protection circuit. Anything from 5 to 15 turns will work. Then again, fewer turns would result in a higher voltage output, but have heavier loading on the power supply. Follow the diagram above, and wire it up... and you're done! Now all you have to do is locate your high voltage return pin. Simply turn the unit on, and very carefully bring the high voltage output wire down to the pins on the bottom of the flyback. The pin that it arcs to it like crazy is the pin you're looking for. You'll want to attach a length of wire to that pin to prevent it from getting too hot and melting. It's completed! Your ultra simple flyback driver which is easy to build and use! Above you can see a pictures of the flyback operating. The output voltage is close to 20+kilovolts, which is enough to ionize the air without any ground nearby, as can be seen. The corona extends up to 5 mm into the air, and once struck the arc can be pulled up to little over 2 cm. It makes a loud hissing sound. In this 1/2 second exposure, the electrical arcs can be seen arcing to ground. The rightmost picture is a 1/42 second exposure with flash. It's a bright HOT arc when placed close together! The metal electrode is currently red hot and ready to melt. Lots of sparks. Finally, some nice arc pictures through xenon tubes. Due to my latest acquisition of a 408W 12V power supply unit, I am able to carry out the more powerful single transistor driver experiments. As expected, there was a significant improvement over the 50W lightning transformer driver. The arcs look different (less lightning like) and have a characteristic hissing sound associated with its frequency. 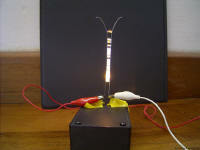 A much higher voltage is obtained and the arcs can be drawn longer as well. It is more powerful and much higher voltages can be obtained. 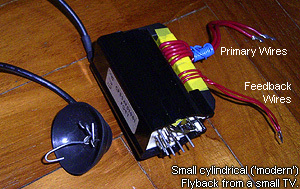 I am currently using the smaller cylindrical type ('modern') flybacks, which was another one I got it for $5 at a TV repair shop, and it was supposedly used in small black and white televisions... so hopefully it'll be good! The output cable is rated 20kVDC only (printed on the cable), compared to the 40kVDC cable from my bigger flyback, from a large colour TV. However, with 5 turns on the primary, the smaller flyback produces longer, hotter and more powerful arcs... and of course a higher voltage, than the bigger flyback! I am very happy with the performance of this small flyback. It is small and reliable. I might try getting another similar transformer and winding it in an anti-parallel configuration for higher voltage, but not just yet. 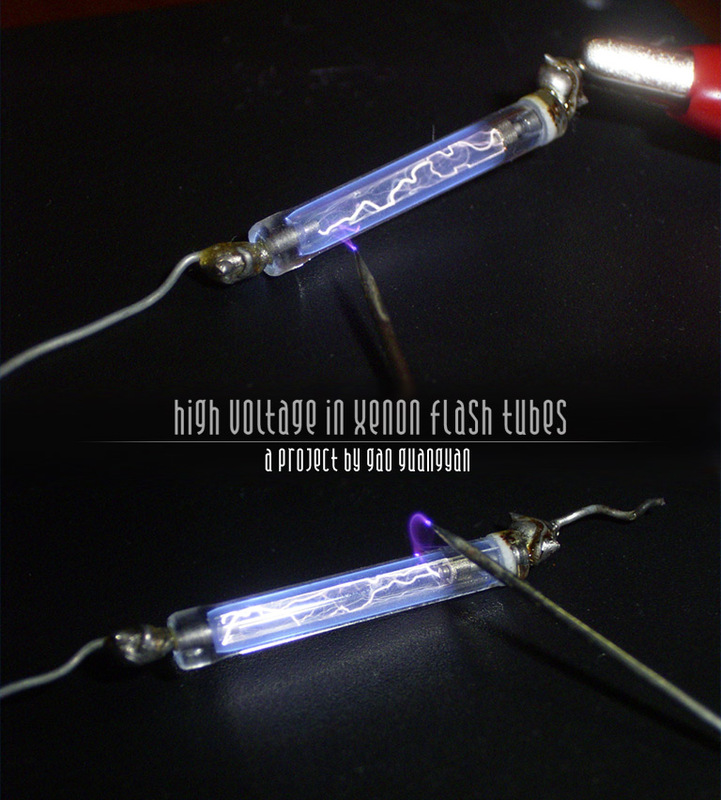 Another lovely photograph of the arcs inside the xenon flash tube. Both air and xenon arcs are clearly visible. Arcs of the flyback. It is difficult to focus accurately... meanwhile, this photo should do. The arcs are much more purple in reality. It is a must to view the flyback videos. Although it's big, it's worth the wait! The video is in 3 parts. In the first part, you can see electrical arcing between the two electrodes. That's a 2cm arc. 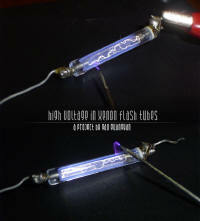 Almost 30,000 volts and can be drawn up to 4cm long. The second part is a close up of the arcs MELTING the electrodes. The third one is an overview. MUST see! 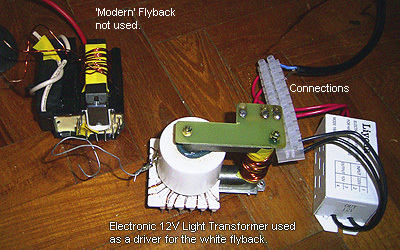 The flyback used is the fat white one, and is powered by a 50W halogen light transformer. Now you have this circuit running, and you have played with it's beautiful arcs, set some things on fire and found that it could light up a fluorescent tube... and you wonder what it can be really used for... Well, you can start off by adding a full wave rectifier to make the output DC, which can than be used to power ion motors (see below), charge capacitors (or just use a modern rectified flyback), or build a Marx Generator! The non-rectified flyback can be used to power Jacob's ladders, light up plasma globes, and much more... With a cascade, very high outputs can be obtained. But first, make sure to check my plasma globe page to see an awesome use for this device! Otherwise, continue to look below to see my flyback powered Jacob's ladder! A Jacob's Ladder is a type of high voltage "climbing arc" display seen in many old Sci-Fi movies. They come in all shapes, styles, and sizes. So how does it work? The simple explanation is that an arc starts at the bottom and due to the fact that hot air rises, tends to move up the diverging rods until they are too far apart for the voltage to be sustained by the power source. Once this arc is struck, the current in the arc will increase to the transformer's limit. Normally the transformer would try to bring the voltage down as current increased. But just above the arc exists a path that the transformer can easily maintain and which in fact will lower its current. At the top of course we are not only at the upper limit of the transformer but it is also where the current is very low and so the arc breaks apart only to re-ignite down below. However, there are some dangers. The electrical discharges in air produce ozone which may be a health hazard. Also note that the rods get very hot! Always allow them to cool down before adjustments. I got to work by quickly setting up two metal wires and connected them to my flyback. Here you can see my Jacob's Ladder setup. 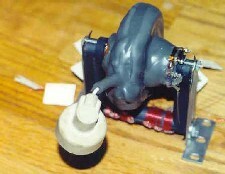 The red wire connects one end to the HV lead of the flyback and the white one is connected to ground. As you can see, it's really small, simple and easy to make. I did the whole set up in less than a minute. The background is a black file so the arcs can seen more easily. Nice, HOT bright arcs form. Not bad at all! Here you can see it starting from the bottom. Here in a 1sec exposure, you can see the arcs rising up towards the top and extinguishing. After continuous use, the smell of ozone becomes apparent and the wires get really really hot. 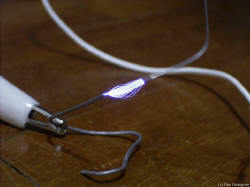 By coating wires with salt, bright yellow arcs form instead of the orange, fiery-like arcs you can see here. Using other salts also yield different colours. This is basically a diagram of how I wired everything up. It's very simple actually. I've tried for both AC and DC and they both work fine. *This will only work for DC, which makes this an extremely useful toy to make if you have a modern DC flyback! Here you can see a simple diagram of the construction of a ion motor. The stand the the wire (yellow) are conductive. Bend a wire as shown in the diagram. The wire balances on top of the stand, with the tips pointing in different directions. When a high voltage is applied, there will be a hissing sound and ions will start to spray off the sharp end of the wires. This propels the wire in a circle and keeps spinning. The speed can be amazingly quite fast! Click here to download a 857kb, 30 second video on the ion motor.